Hello, my German shepherd is four years old and is pregnant. 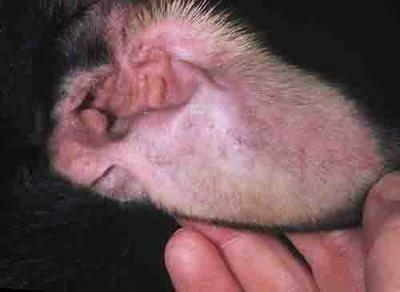 Her problem is that she has dermatitis and swollen ears (one ear is more swollen than the other one). It is a terrible problem and before it becomes a problem I would like to seek out the solution. It’s impossible for me to determine exactly what might be going on with your dog without seeing her, but a couple of possibilities immediately come to mind. First of all, the dermatitis that you mention might be caused by a bacterial and/or yeast infection. Severe infections can be accompanied by a lot of swelling or even the formation of abscesses. Dogs can also develop something called an aural hematoma, which occur when dogs scratch at their ears, shake their heads, or otherwise traumatize their ears to such an extent that a blood vessel ruptures within the flap of the ear. It sounds as if your dog needs to be seen by a local veterinarian. He or she can address both the dermatitis and the swelling and get your dog on the road to recovery.